When creating a phone extension, by default, a matching voicemail box is automatically created with the same number as the extension. Evolution also supports creating voicemail boxes that are not directly associated with any extension (I.E. a general voicemail box) via the voicemail tab. Mailbox This is the mailbox number. Name The name for this mailbox. Note: The mailbox name is used to define users within the Dial-by-Name directory. 0 Reaches Operator Allows callers to access the operator by pressing zero when in the voicemail system. Hide From Directory Hides the voicemail box from the Dial-by-Name directory. Email Address Enter the email address you would like messages to be forwarded to. Leave this field blank to disable the feature. Notification Email/Ph Enter the email address you would like to send a notification email to when a new voicemail is left. Voicemail messages are not attached to notification emails. Attach Voicemail Select "Yes" to attach a voicemail message to the email address specified in the "Email Address" field. Note: This does not include the "Notification Email/Ph". Auto Delete Select "Yes" to automatically delete the voicemail message from the system after it has been emailed. Select "No" to keep the voicemail message on the system after it has been emailed. 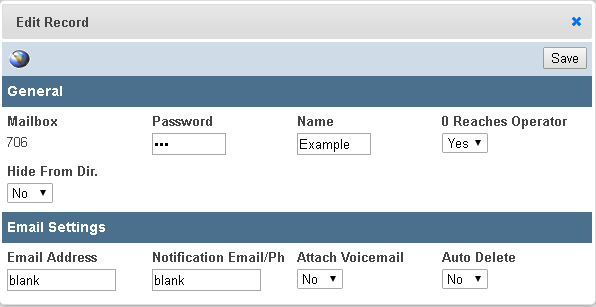 Global voicemail settings can be accessed by clicking the "globe" icon from within the "Edit Record" window when modifying an existing voicemail box. Max Length Select the maximum length (45 seconds-8 minutes) for a voicemail message. Default setting is 5 minutes. Min Length Select the minimum length (2-9 seconds) of a voicemail message. Note: Messages shorter than this length will not be saved. 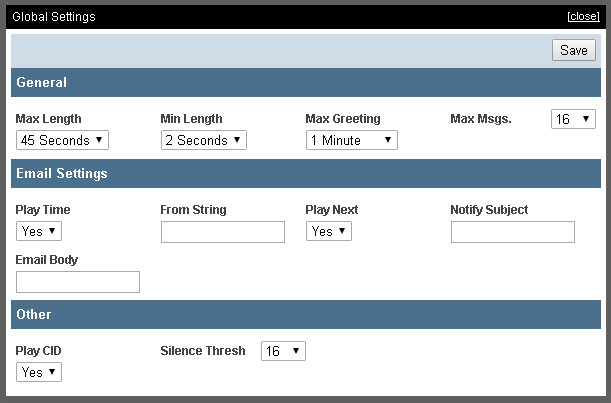 Max Greeting Select the maximum greeting length (1-8 minutes) for your greeting. Default setting is 4 minutes. Max Msgs Select the maximum number of messages (16 - 512) a voicemail box can contain before a caller hears the mailbox is full message. From Field This is the email address that displays in the 'from' field when voicemail emails are sent. Notify Subject This is the subject line of voicemail notification emails. Play Time Play date and time before playing back message. Play Next If set to "Yes", when a voicemail message is deleted, the system will automatically playthe next message. Play CID Read back callers telephone number prior to playing the incoming message. Silence Thresh Determines the threshold or sensitivity for silence that triggers a voicemail recording to end. A high setting may result in false-positives and a real low setting may fail to detect the silence. To access voicemail for the extension you are dialing from, simply dial *97. If you need to access a different voicemail box than the extension number from which you are dialing, dial *96 and you will be prompted to enter the voicemail box number and password. The voicemail system consists of the following menus. 1 New Messages Plays new voicemail messages in the Inbox. 2 Change Folder Change to a different folder. 0 Mailbox Options Setup your voicemail recordings. * Help Repeats the current menu. # Exit Ends your call to the voicemail system. 1 Skip Message Envelope Skips directly to the message and bypasses the message envelope. The envelope is the date, time and CID information that precedes each message. 2 Start Message Over Replays the current message without the envelope information. Press 1 to send a voicemail reply to a caller on the same system. Press 2 to call the person who left the message. Press 3 to hear the message envelope information. Press * to return to the main main menu. 4 Skip Message Skips the current message and plays the next message. 5 Repeat Message Replays the current message including envelope information. 6 Skip Message Skips the current message and plays the next message. 7 Delete/Un-delete Message Deletes/un-deletes the message that you are listening to or just listened to. 8 Forward Message Sends the current message to another voicemail box on the system. Press 1 to prepend a message to the voicemail message, or press 2 to forward the voicemail without a prepended message. The message will not be automatically deleted from your voicemail box. You will need to delete or save the messages as normal. 9 Save Message Saves the message. * Help or Skip Backward Two Seconds While listening to a voicemail message, you can press * to rewind the message by two seconds. Or, if a voicemail message is not being played, press * to hear the menu options. # Exit or Skip Forward Four Seconds While listening to a voicemail message, you can press # to fast-forward the message by two seconds. Or if a voicemail message is not being played, press # to exit. 0 New Messages This folder consist of new messages that have not been listened to yet. 1 Old Messages This folder contains all of your saved or skipped messages. 2 Work Messages Folder to store saved messages related to work. 3 Family Messages Folder to store saved messages related to family. 4 Friends Messages Folder to store saved messages related to friends. # Cancel Return to the main menu. 1 Record Unavailable Message This is the messages callers will hear if they call your extension if you are not on the telephone and you do not answer (your telephone is not busy but you do not answer). 2 Record Busy Message This is the message callers will hear if they call your extension and you are on the telephone and you do not answer (your telephone is busy). 3 Record Name This is the recording that callers will hear when they first reach your voicemail box but before your Unavailable or Busy Message. If you do not record your name then callers will hear a standard greeting that announces your voicemail box number (for example, “the person at extension 1001 is unavailable...” versus “Jane Doe is unavailable...”). This recorded name will also be used in the dial-by-name directory if your system has been configured with a dial-by-name directory. 4 Record Temporary Greeting This is a temporary message that callers will hear that is different than your Unavailable and Busy Messages. The Temporary greeting is useful for extended absences such as a vacation. It allows you to record a temporary message so that you do not have to record over your Unavailable or Busy messages. If you record a temporary greeting it will automatically become the active greeting, when you delete the temporary greeting your voicemail box will automatically revert back to the standard Unavailable and Busy Messages. 5 Change Password Allows you to change the password to your voicemail box.